I knew I needed help organizing my home office when I couldn’t find a pen. At first, I rationalized that maybe I didn’t really need a pen – my lipstick was nearby and so was the pencil the kids and I used last weekend to keep score for miniture golf. Then, I felt that cramp in my foot that makes my toes curl and stiffen and is so painful it must mean that a blood clot is gearing up to travel to my brain and kill me. If that happened, I suppose a pen isn’t what I would be needing, anyway, but it got me thinking what I think fairly often since I lost Jimmy – If I die my kids will have to wade through everything to get the house in shape to sell – after – of course – they have that one last party. Part of me said, so what? but the other part that is the ‘Gallant’ to my ‘Goofus’ won out and I called Cynthia, a professional organizer. She had an opening the very next day, a cancelation. I was a tinge suspicious of my ‘luck’ especially when she suggested that the first thing we try to find is not a pen, but my checkbook. Cynthia put together a filing system for me and we filled up many many hefty bags with notes I couldn’t decipher to people I couldn’t remember. 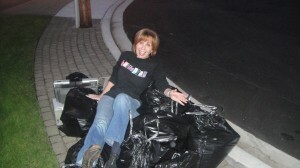 She was an amazingly strong woman who insisted that she carry all the bags to the curb herself. My job was to pose for the above photo. What you don’t see is me trying to get up. Another thing you don’t see is my neighbor’s eager and hopeful faces one after another as they tried to quiet their excitement to ask ”Are you moving? I heard them loud and clear – This is life in suburbia. Everyone wants the widow to either to sell the house to a young family with small kids for their small kids to play with or the next best thing is a family with a daughter who is babysitting age. I know this is true because in my other lifetime I would have looked at me and felt – time for that 55 and older community, Sweetheart. Come on. Get on the bus. Gee, hefty bags really bring out the worst in people…all I wanted was a pen.